There’s only one show that re-creates the timeless California spirit and incredible music of The Beach Boys as it was meant to be experienced. Direct from the entertainment capitol of the world, Las Vegas, NV. 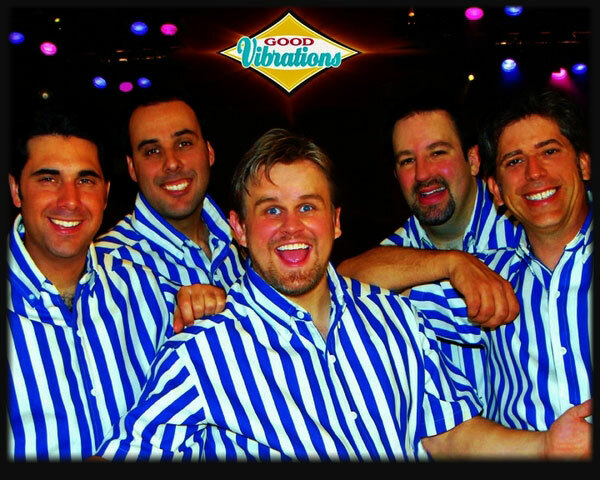 Good Vibrations features a cast consisting of members from founding Beach Boys’ Brian Wilson and Al Jardine’s respective touring bands. This makes Good Vibrations the ONLY Beach Boys show qualified to faithfully re-produce all of those legendary songs and harmonies the way you remember them. More than just your typical tribute band, Good Vibrations brings the days of sun, surf and cars back to life with a full scale Las Vegas style production experience complete with era-specific costumes, multi-media video and surfer girls! All of the famous guitar riffs, melodies and ocean-deep harmonies are faithfully re-created right before your eyes and ears. Good Vibrations is guaranteed to have the crowd on it’s feet, dancing and singin’ along to the greatest hits of America’s most legendary band. We also offer a scaled down, “beach party” band version for functions and budgets that don’t require the full production experience. Whatever the occasion, it’s time to load up the woody, grab your board and get ready to hit the beach with Las Vegas’ totally awesome surf show, Good Vibrations: A Celebration of The Beach Boys! You can book Good Vibrations for your next event just by clicking the "Book Them Now" button to the right and filling out the form. We will be in contact with you about their availability as soon as possible.